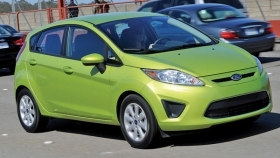 Fiesta output in Mexico will boost Ford's third-quarter total. U.S. car sales may be starting to look soft, but North American automakers are sticking with the plan when it comes to boosting production. Automakers will produce nearly 2.9 million light vehicles in North America during the third quarter, up nearly 23 percent from the year-ago period, predicts the consulting firm IHS Automotive. On an annualized basis, the third quarter's rate would amount to 11.8 million units of North American production -- not exactly boom times but certainly better than last year. The consulting firm's third-quarter projections haven't changed much since May. But that very lack of drama is what matters. Automakers are not getting panicky over the U.S. market's slow recovery. Mike Jackson, IHS Automotive's director of North American vehicle forecasts, says his outfit is nudging its 2010 U.S. vehicle sales projection from 11.8 million units down to 11.5 million. But vehicle inventories are "very manageable right now," he adds, "and certainly we expect sales to improve next year, no question." With the exception of Toyota, each of North America's top six vehicle producers is expected to raise third-quarter production from a year ago. General Motors Co. has announced one of the most aggressive production schedules this summer. IHS says GM will raise third-quarter output 32 percent to 695,000 units. GM went public with its plans June 18, when it announced it would keep nine of its 11 U.S. assembly plants operating during the traditional two-week summer shutdown. During that period, the company says, those plants will produce 56,000 vehicles. Despite the industry's disappointing June sales, GM has not changed its 2010 U.S. light-vehicle sales forecast, which ranges from 11.5 million to 12 million units. "We're cautious, but we didn't see any reason to adjust our sales forecast for the year," said GM spokesman Dave Roman. "Steady as she goes." By contrast, IHS predicts Toyota will produce 349,000 vehicles, down 1 percent from the year-ago period. The downturn is the result of Toyota's decision to shut down the New United Motor Manufacturing Inc. assembly plant in Fremont, Calif.
Ford Motor Co. is expected to raise third-quarter production 22 percent to 613,000 units as its Cuautitlan, Mexico, plant raises Ford Fiesta production. Chrysler Group is expected to raise vehicle production 25 percent to 351,000 units. The automaker has propped up sluggish retail sales by boosting sales to rent-a-car companies and other corporate customers. "Chrysler is relying pretty heavily on fleet sales," Jackson said. "You have to play the cards you are dealt. They have to make sure they maintain volume." Honda is expected to raise production nearly 20 percent to 328,000 units as it ramps up output of the redesigned Odyssey minivan. And Nissan will boost production 12 percent to 218,000 units. North America's other automakers will boost production 48 percent to a collective 335,000 units -- mostly on the strength of Kia's new assembly plant in West Point, Ga., which launched production of the Sorento last November. Although summer is here, the auto industry appears unlikely to indulge in its traditional everything-must-go summer sale. That's because vehicle supplies remain low. Of the seven biggest-selling U.S. automakers, Chrysler Group had the largest supply on July 1: 60 days, which is considered ideal. At the low end is Hyundai-Kia Automotive, which has only a 35-day supply of vehicles. The moderate supplies offer evidence that automakers have become much more disciplined about projecting future demand. "Everybody is cautious," Jackson said. "They want to be aligned with the new reality." With supplies under control, vehicle production is less likely to spike and plummet, and that is good news for both dealers and suppliers. Dealers are less likely to face pressure to order unwanted vehicles, while suppliers can expect predictable production schedules. "Right now, the pace [of the market's recovery] has been turtlelike," Ford analyst George Pipas says. "Fortunately, we didn't plan on a robust recovery. Everything looks pretty good right now."